Can I just tell you how much I love my new washing machine? It has been completely life changing for me (which I do recognize is pretty pathetic). In order to understand why I love my new one so much it's important for you to know how bad my old washing machine was. It leaked water so we had to keep a jug under it. The jug had to be emptied every 3 loads otherwise it would overflow onto the basement floor. The washer didn't spin properly (or something) so about half the time I had to spin the load twice. It got to the point when I was happy to just have to spin it twice and not rinse and spin again since towards the end I'd go down and the clothes would be both wet and soapy. Plus, often the clothes were STILL dirty after all that! Oh, and if you washed towels or sheets it made a horrific noise that you could hear all throughout the house. You couldn't even think about washing anything large in it without committing to rinsing and spinning it like three times. Oh, kid, you peed all over your comforter? Sorry, your comforter's dead to me. 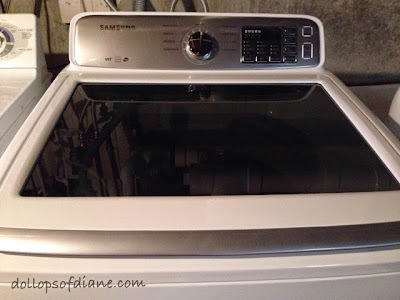 I finally hit my breaking point as did my husband (who I'm sure was sick of the piles of laundry around and my constant complaints), so we bought a new washing machine shortly after Christmas. We got a Samsung energy efficient top loading one. OH.MY.GOD. It's amazing. Know what it does? It WASHES clothes - correctly - on the first try! It is quiet, it is smart, it is friendly, it is magical. I can now happily wash several loads of laundry a day without having to rip my hair out. I never should have let Cheap Diane make me wait so long for a new one.